Take one capsule 1 or 2 times a day, during a meal. Powerful dose of omega-3 -unsaturated fatty acids, necessary for the proper functioning of the body. Regular taking the product protects the heart and circulatory system, supports the immune system, improves the efficiency of thinking, understanding and remembering. There is a misconception that fish is a secure source of omega-3. Research shows that meat fish accumulates heavy metals and toxins that are dangerous to human health. 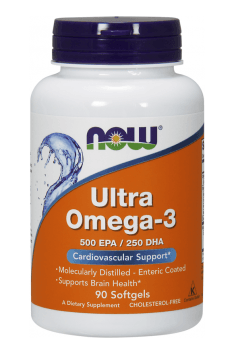 The only safe way to add to your diet omega-3 is taking the proven supplements. Prophylactically I recommend this to everyone. The optimal dose is 2 capsules taken two times per day during the meal. Even with extended use, there were no side effects. A complex of vitamins and minerals for athletes doing a hard workout.